Welcome to 1955FordTrucks.com. 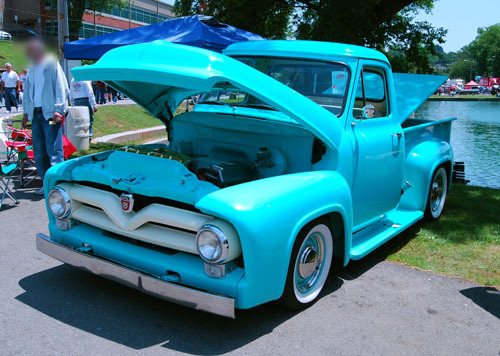 1955 saw a repeat of the basic 53 and 54 F100 body styles. The major change for 55 was the grille. It now had a v shape in the center. V8 emblems, or 3 point chrome star emblems on the grille for 6 cylinder trucks were different for 55. Also, larger parking lights were a great new addition. One other change was the side hood Ford F100 Emblems. You could get a custom cab and the door emblems to go with it. Engine options changed slightly. 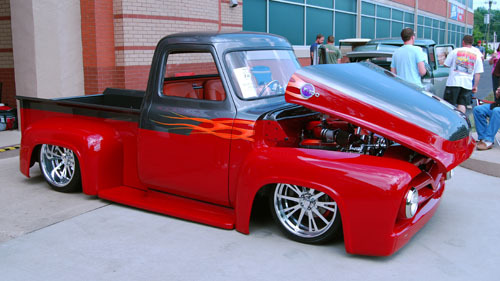 Other than that, most of the truck was a repeat of the successful 1953 F100 and 1954 Ford Truck. There is also great information and 1955 Ford Truck Parts at CMWTrucks.com. CMW Trucks offers hundreds of restoration parts and hot rod parts for 1955-1956 Ford F100's. We specialize in them and carry several original style and custom parts that other suppliers do not usually have.